Two men whose plot to bring nearly £30,000 worth of cannabis into Shetland was scuppered have been sent to prison. TWO men whose plot to bring nearly £30,000 worth of cannabis into Shetland was scuppered when the speedboat they used to ferry the drugs into Lerwick off a NorthLink ship sparked the attention of the emergency services have been sent to prison. Mitchell Cross, 26, of the Observatory, Lerwick, was given four years behind bars when he appeared at Lerwick Sheriff Court on Wednesday. Twenty eight-year-old Alasdair Kelly, of Inchrye, Sandwick, was given a prison sentence of two years and four months. 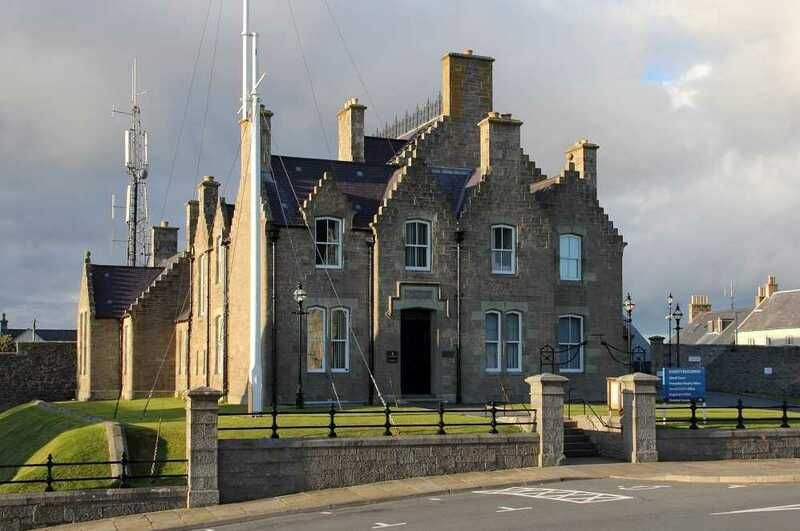 The court heard that Kelly – wearing a wetsuit and waiting in a speedboat – was given a hold-all bag of cannabis and cannabis resin when Cross arrived back in Lerwick on the NorthLink freight boat Helliar on 18 December 2016. But their plan was botched when Kelly failed to correctly secure the speedboat at the nearby Hay’s Dock – leading to the boat floating out to sea before it was rescued by the Lerwick lifeboat, sparking a full-scale search for Kelly in the process after he was spotting swimming in the water before disappearing. The pair previously admitted supplying cannabis and cannabis resin from their homes and other addresses and locations in Lerwick and the cargo boat Helliar between 4 September 2015 and 18 December 2016. Sheriff Ian Cruickshank said the incident in December 2016 was probably the “tip of the iceberg” when it came to their involvement in drug dealing. Procurator fiscal Duncan Mackenzie said the plot was a “sophisticated and carefully planned endeavour which only just failed”. The court heard the Cross was the ringleader in the operation, with close friend Kelly helping out. Mackenzie said Cross had booked a one-way flight to Aberdeen on 16 December 2016 for the next day. He aroused suspicion, however, by getting a taxi in Lerwick and asking the driver to take him to buy two inflatable fishing buoys before heading to the south mainland. When Cross arrived in Aberdeen with a hold-all bag following the flight he phoned NorthLink Ferries to book himself on the northbound freight boat that night, despite staff telling him that there was plenty of space on the passenger ferry. He used his brother’s name and address when booking, and when he went on the freight ferry, he was seen with a now-full hold-all. The bag contained one kilogram of cannabis and four kilos of cannabis resin, Mackenzie said. The freight boat arrived in Lerwick at around 11.30am on 18 December 2016, with Kelly on hand in the harbour in speedboat. With the pair on contact on mobile phones, the bag was quickly transferred to Kelly in the speedboat, who then stopped off at the nearby Hay’s Dock – but the boat started to drift into the sea. He had managed to retrieve the hold-all – which also contained one of the buoys – and put it over a fence. The police were fed information, however, when someone spotted Kelly “dripping wet” and making a “panicked” phone call to ask to hide at a friend’s house. The man remained in hiding at his friend’s home, but he was eventually detained by police. Cross was later detained and he initially said he had been in Aberdeen for Christmas shopping. A number of bank accounts were also discovered between the pair which had transactions involving thousands of pounds – mainly carried out by Cross, who was said to have had a gambling problem. Kelly’s defence agent Gregor Kelly said that his client was more of a “cog in the wheel”. “Kelly knew that he was being asked to collect drugs that would be dropped in the water,” he said. The lawyer said it was Kelly’s contention that he did not benefit financially from the dealing. He said it was only the “ineptitude in not tying up the boat” that led to the offence coming to light, adding that Kelly was “semi-hypothermic” after fetching the drugs out of the water. Tommy Allan, defending Cross, said his client had “accepted in full” his involvement in the dealing. He said Cross’ finances were in “chaos” at the time following “fairly substantial” gambling. Sheriff Ian Cruickshank noted that the pair had admitted being involved in drug dealing over a period of 15 months and not just on one day. He said given the suspicious money activity in the various bank accounts, it was likely that the operation on 18 December 2016 was only the tip of the supplying. The sheriff said the botched job in Lerwick Harbour was a “calculated and tenacious venture” symptomatic of a “commercial operation for profit”. He said there was no alternative to a custodial sentence for the pair, adding that he had considered if the case should have been referred to the High Court.